The 2016 election will be the first presidential election in 50 years without the full protections of the Voting Rights Act (VRA) thanks to the Supreme Court’s gutting of it in 2013. Twenty-one states have put new voting restrictions in place since the 2010 election, with voters in 15 states facing these obstacles for the first presidential cycle in 2016, including in crucial swing states like North Carolina and Wisconsin. 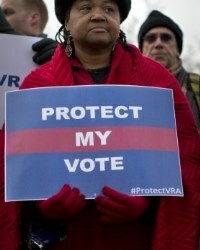 Congressional Democrats unveiled a new strategy to build support for the Voting Rights Advancement Act (VRAA). The bill compels states with a well-documented history of recent voting discrimination to clear future voting changes with the federal government. It also requires federal approval for voter-ID laws and outlaws new efforts to suppress the growing minority vote. The effort has been dubbed “Restoration Tuesday” and it will spotlight stories of modern-day barriers to voting. To build a coalition to pass the VRAA, members of Congress will speak out every Tuesday about the importance of voting rights. The VRAA currently has 119 cosponsors in the House and 39 in the Senate. With only three Republicans sponsors to date, Congressional Democrats hope to use “Restoration Tuesday” to convince their fellow members to support the legislation.